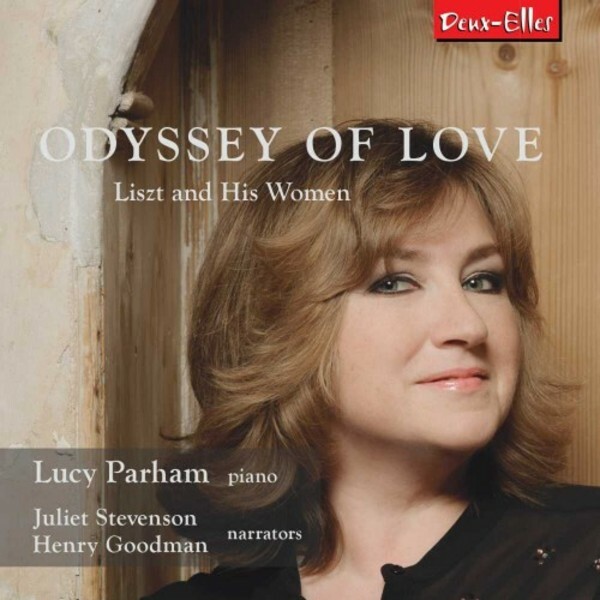 Acknowledged as one of Britain’s finest pianists, Lucy Parham applies her sensitivity and imagination not only to concertos and recitals, but also to portraits in words and music of such composers as Schumann, Chopin, Liszt and Debussy. She came to public attention as the Piano Winner of the 1984 BBC Young Musician of the Year. Since her Royal Festival Hall concerto debut at age 16, she has played throughout the UK and around the globe. Lucy is also a regular contributor to BBC Music Magazine, Pianist Magazine and the Guardian, and appears frequently on BBC Radio 3 and 4, as the commentator on the Leeds International Piano Competition and as a jury member for the final of Young Musician of the Year. Following the success of ‘Nocturne' – a musical portrait of Chopin released last year, Lucy now presents another of her popular programmes that combine words and music, released for the first time on disc. ‘Odyssey of Love’ sees Lucy focus on the romantic life of Franz Liszt, featuring narration by celebrated actors Juliet Stevenson and Henry Goodman. Like Mozart, Liszt was a child prodigy, whose three main loves in life were music, women and religion. Women flocked to his concerts, where his ecstatic performances (he was the first pianist to present recitals without the music) caused fainting and hysteria among his largely female audiences. However, of the many courtesans and countesses with whom he was linked, two stand out. The first was Marie d’Agoult, a married aristocrat who became both muse and mistress to the young virtuoso, and later mother to his 3 children. Marie inspired piano pieces such as the ‘Petrarch Sonnet No.104’. The second, the cigar-smoking Polish intellectual, Princess Carolyne Wittgenstein, was the muse of Liszt’s middle age without whom Liszt found it almost impossible to compose and to whom he dedicated many of his finest pieces. The story of their failure to marry is a sad and compelling one, which is told in the second half of the programme.